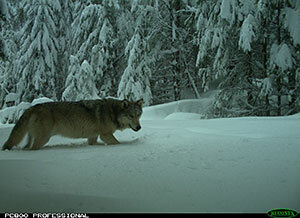 The Oregon Department of Fish and Wildlife today announced the discovery of new wolves in Western Oregon. Little is known of these “Indigo wolves.” According to ODFW, a US Fish and Wildlife Service trail camera in the Umpqua National Forest captured images of three wolves on Feb. 20, 2019. "This is exciting news," said Steve Pedery, Conservation Director for Oregon Wild. "Up to this point, there have only been a smattering of known wolves in Western Oregon and only one official pack. While there have been rumors, these wolves appear to have stayed well out of the public eye. We hope that federal and state policies allow them to continue to thrive in these backcountry habitats, hidden away from the political fights and unnecessary conflict that may threaten their survival." "The opportunity to once again hear a wolf howl wolf echoing through the backcountry around Diamond Peak, or through the old-growth of the Willamette and Umpqua National Forests, is an experience Oregonians will cherish for generations to come." Both the Rogue Pack and these Indigo wolves appear to have settled into the roadless areas that make up the Crater Lake Wilderness proposal.